Diamondbacks and Tigers and Garters, Oh my! I had an opportunity recently to show one of my favorite local herping spots to an old/new friend. He had been into reptiles several years ago, and is now recently getting back into reptiles with his sons. 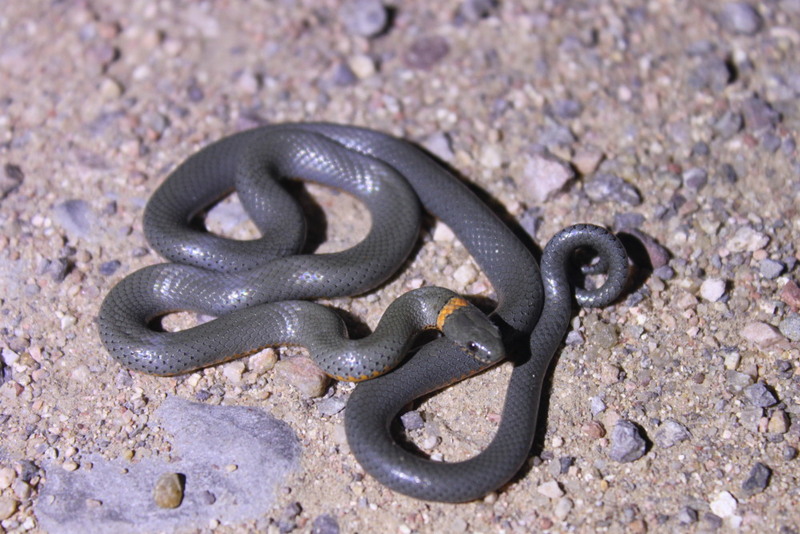 We have begun to have some monsoon activity in our area recently and I thought that my nice little local spot might be productive when he texted me asking if we wanted to go herping that evening. 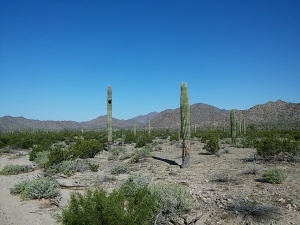 It had rained fairly well near my spot and the daytime temperatures were cooler today– perfect for desert night hiking. We made our way over to the spot and with our lights ready and our hopes up we began our night hike. 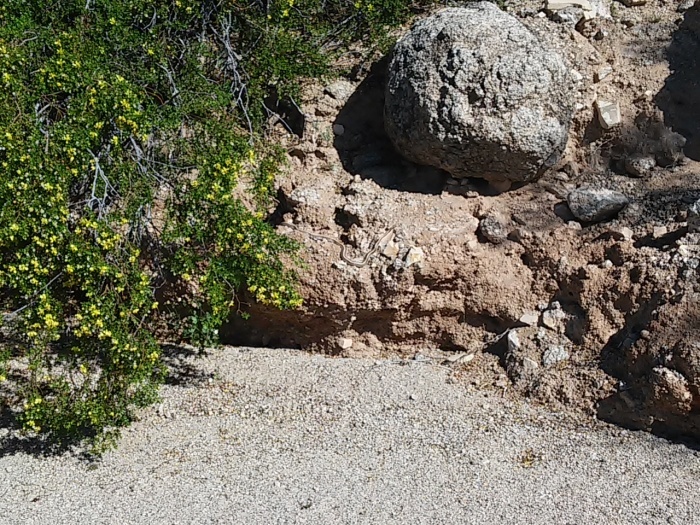 We were greeted within the very first portion of the trail with a nice little western diamondback rattlesnake patiently waiting for prey to come by. 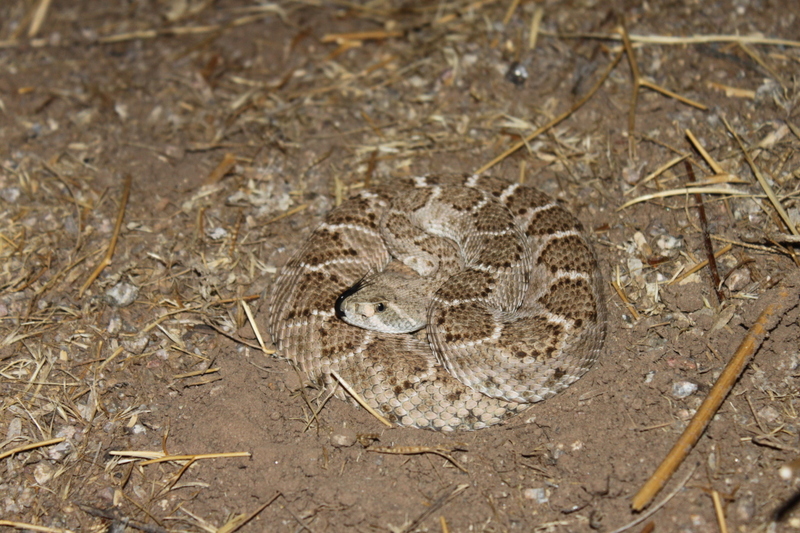 I often see rattlesnakes in this waiting position when finding them on night hikes. 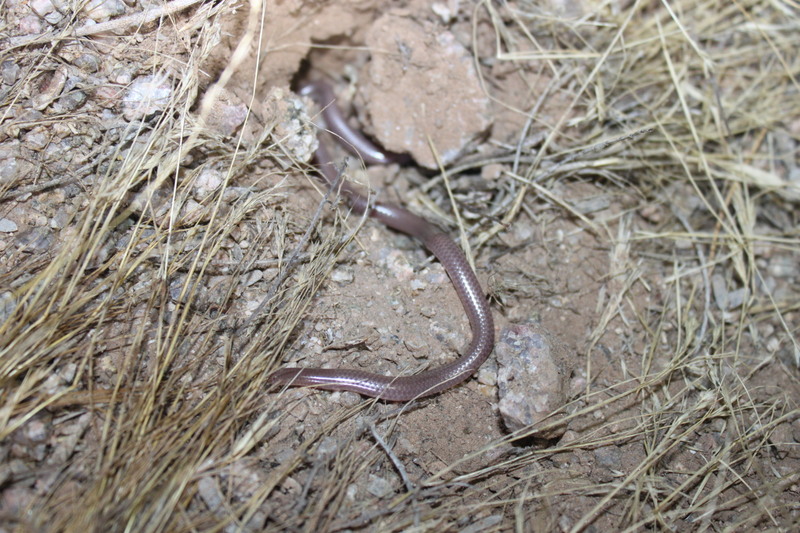 During the day or while road herping I will most often see them stretched out while on the move. About ten minutes later, while hiking through a more secluded and shaded spot, I walked right past this tiger rattlesnake. Tiger rattlesnakes are really quite interesting. They are less often seen as their activity is often very seasonal–it is in my experience tied closely to precipitation. 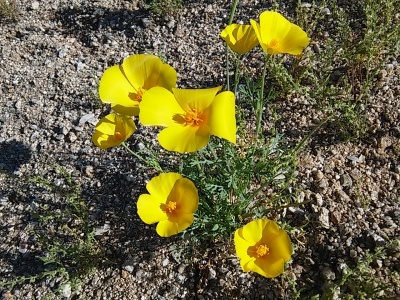 I have found them in the spring following rains, and in the summer following rains, but haven’t really found them at any time of the year when it is dry. Hiking a ways further, we didn’t find any other reptiles for about twenty minutes or so. 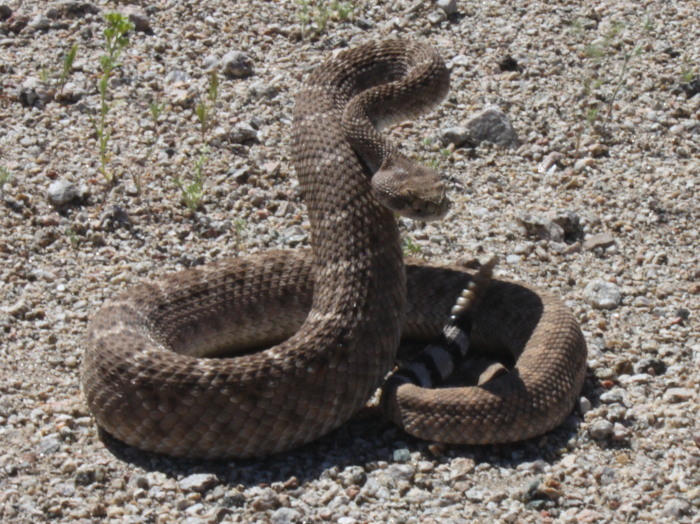 Then, retracing our steps as we turned around on our hiking trail in order to make our return journey, we found another western diamondback along the edge of a dry wash. We took a few photos and continued our hike. Our next snake was found slithering along the trail headed in the same direction we were hiking. 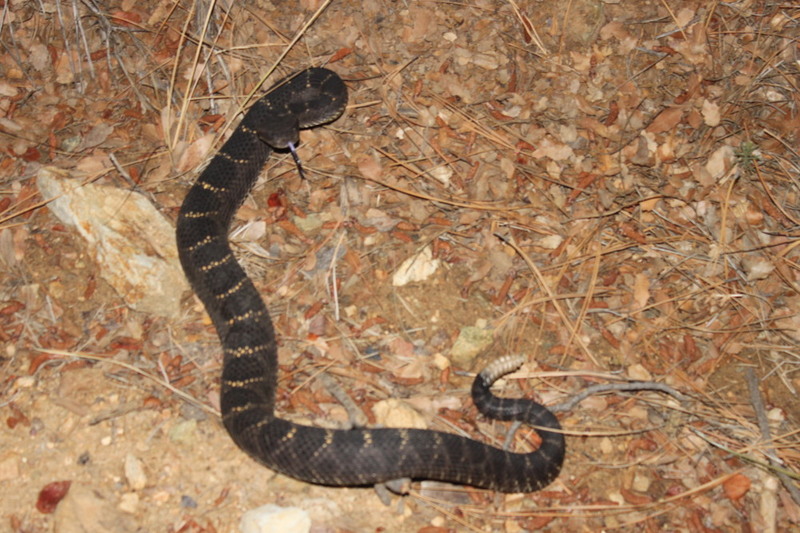 It was another tiger rattlesnake! This one was a little larger and had more body weight than the first. We were now up to our fourth rattlesnake of the hike! 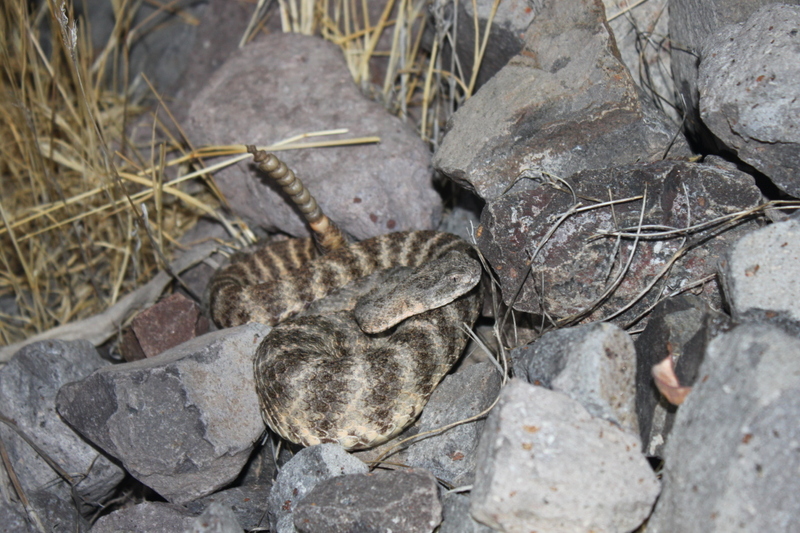 We took some more photos of this tiger rattlesnake and continued our hike. The remainder of the trail was uneventful. We decided to try another spot near a water source. The area was not as nice as my local spot, but we did manage to turn up this small checkered garter snake. I don’t recall ever finding a baby checkered before, and I first assumed that it was a young black necked garter snake. 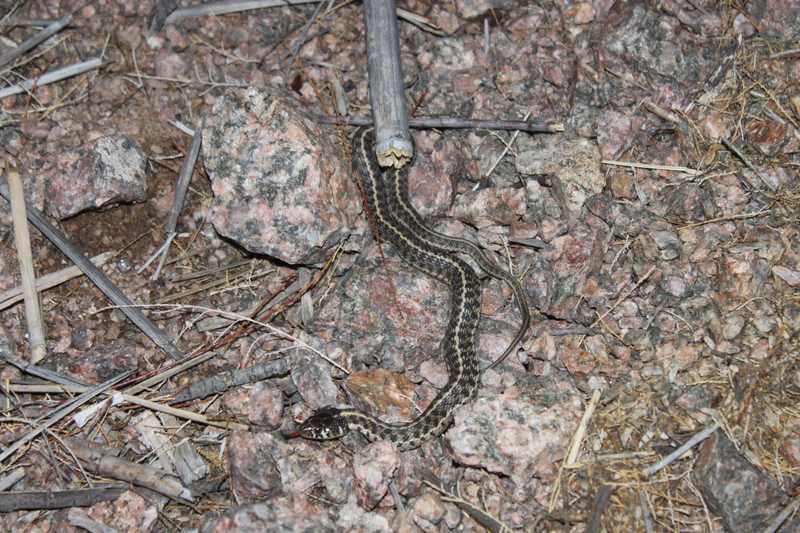 After coming home and seeing the photos, though, I think it was a checkered and not a black necked garter snake. The monsoon season is still young and I hope to head out at least another two or three times. I am in the middle of a move to a new area am looking ahead to being very busy over the next few years so I hope I will continue to find time to herp. I had the opportunity this past weekend to hit a somewhat local spot that I have been meaning to hunt for many years. 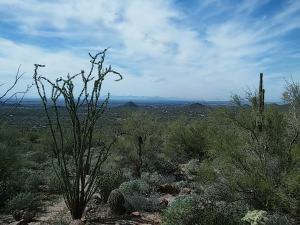 It is in a mountainous area that is out of the lower desert where temperatures are a bit cooler (for Arizona). We had a good heavy rainstorm on Friday and so me and my trusted herping companion decided to give it a go. I recently had my AC repaired in my truck so I felt exciting to go herping in the nice cool AC. We climbed higher in elevation and the air started to cool a bit. 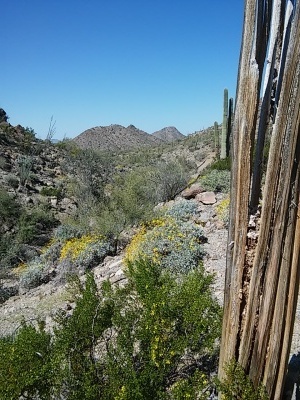 We passed a few tarantulas, and then found a beautiful black tailed rattlesnake, which I was unable to photograph as it escaped to a very steep rocky slope while I was getting my camera! 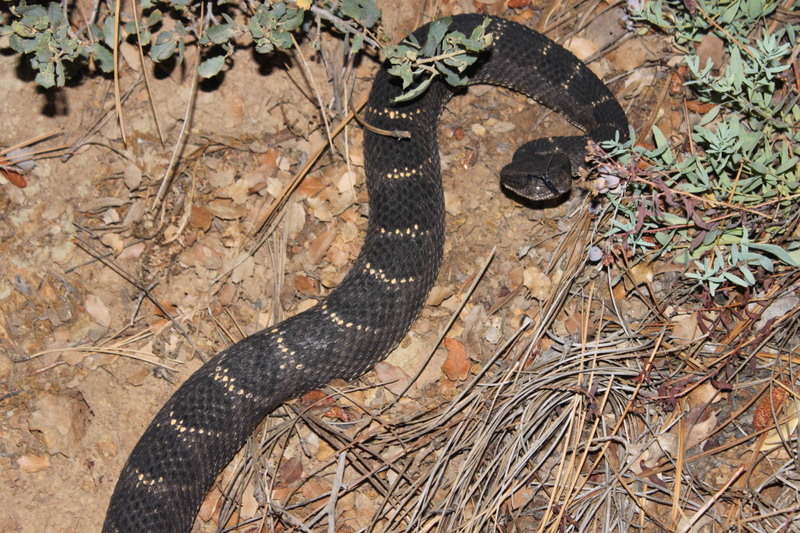 We climed a bit higher in elevation and eventually found this gorgeous Arizona Black Rattlesnake. We actually did not see the animal on the road, it was off the shoulder in the brush but we heard it rattle as we passed it, which is also how I found another a few years ago. This one was nice and dark and healthy looking. We left this majestic animal in peace and continued our search. About 45 minutes later, we were again greeted by this same animal. It had traveled only a short distance from where we had located it the first time. We found other interesting beetles and centipedes (which I did not photograph) on the search, but no other snakes. 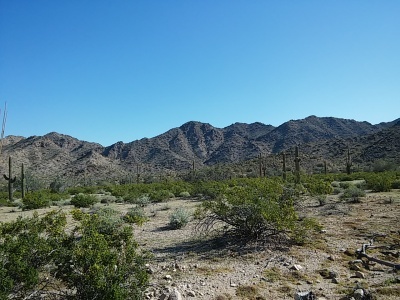 We didn’t expect to be out too late that evening, but we did do a little exploring on the way home, finding a potentially good place to find Arizona Mountain Kings that deserves exploring at some future date. I am looking forward to one or two more short outings this monsoon season! We have been exceptionally blessed this year with excellent herping weather. I just wish that I had more time available that I could put towards field herping. Life is continually busier and filled with additional responsibilities (which isn’t necessarily a bad thing). This spring was very mild, with low temperatures throughout the spring and into the month of June. In fact, I was camping in snow in Arizona in the middle of May! Following some rainstorms (the next day or two after the storm), I went out with a group of regular herping friends to a local spot. We didn’t find large numbers of herps, but did find two species that up until that point I had never encountered at our chosen location. The first snake of the evening was this blind snake, also commonly called thread snakes. I don’t see these snakes all too often, unless you count all of the blind snakes that I find in my local neighborhood due to the irrigation systems that we have in my old 1960’s neighborhood. They are quite small, and are most easily detected by their shiny scales. Light reflects very well off of their scales, making them somewhat easier to see than they otherwise might be. 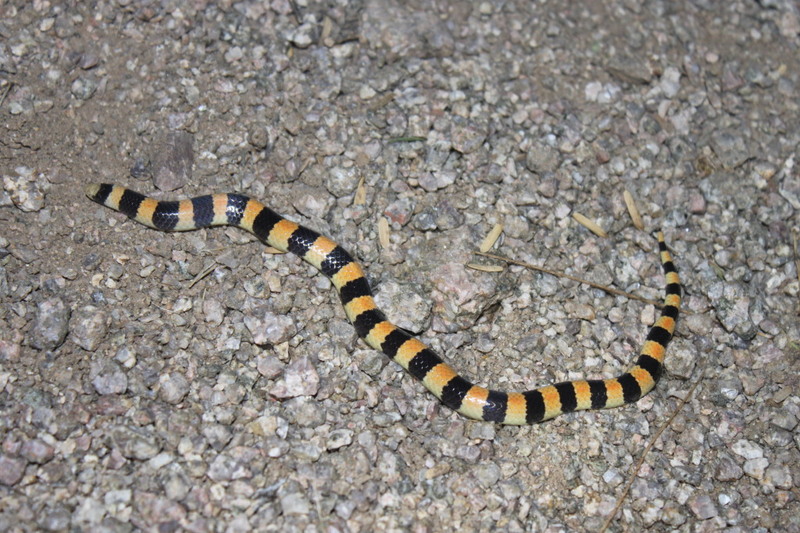 Not too long afterwards, we also found this pretty little banded sand snake. 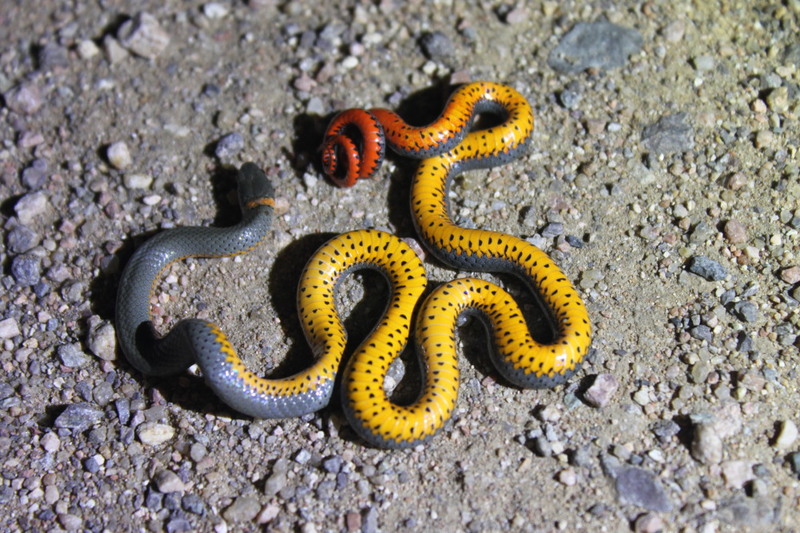 These snakes are likely very common in the habitats that they inhabit. For me, though, it had been over 20 years since the last time that I found this species in the wild. Only recently, though, have I again begun to spend significant amounts of time herping in the areas in which these snakes might be found. Thats pretty much it! A short little local trip is always successful when you night hike a few snakes! 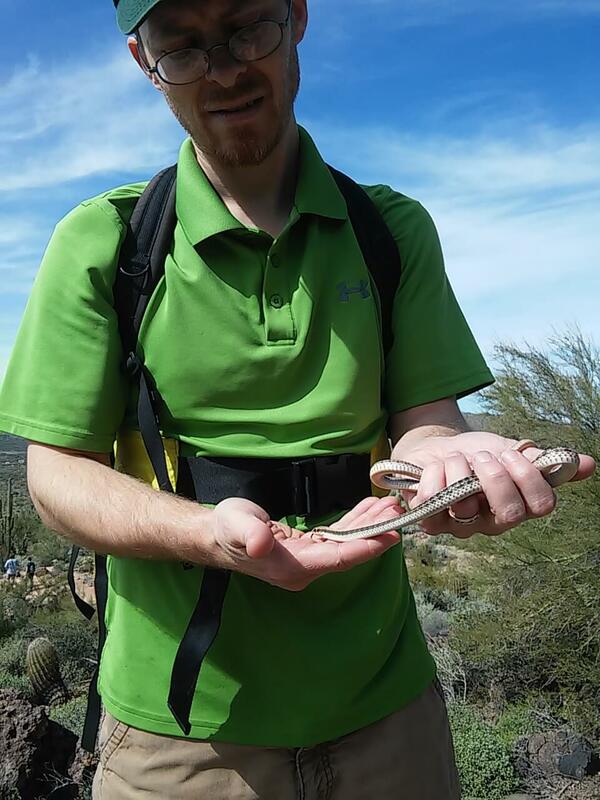 I had the chance along with my best bud to get out on a hike to enjoy nature and to look for reptiles. As were driving to our hiking spot, we each made guesses as to what we would find on our hike. We made a first and a second guess. I chose a patchnose snake as my first guess. 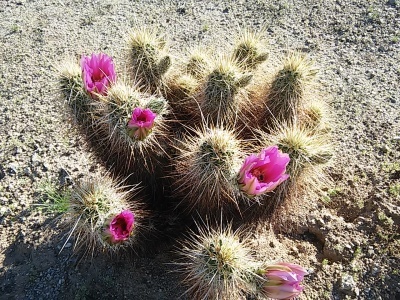 I have routinely found them on spring hikes in the sonoran desert, so I thought this would be a good choice. 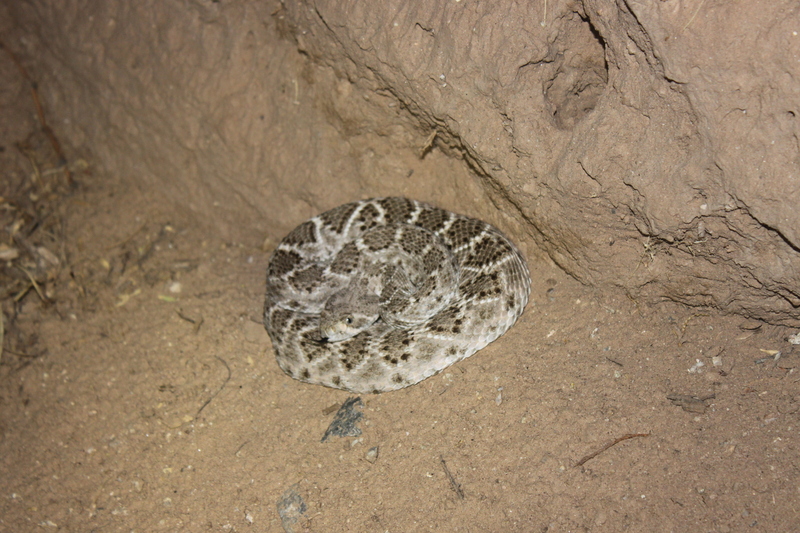 For my second guess, I got a little braver and chose a speckled rattlesnake. My friend chose a ground snake and a black headed snake. I went on a short 3 mile hike with my daughter and neice today. The weather is very nice this time of year, in mid February. Temperatures were in the low 80’s today. At this time of year reptiles are once again active on the warm days like today. We hiked up the trail and found this beautiful patch nosed snake on the side of the trail, the front half of its body was hidden under a rock, but the rest of it was right out in the open and easy to see, and to grab. Feeling the need to warm up, like this Blacktailed Rattlesnake! Happy New Year! It is very cold over here in Arizona so far in 2015! We had snow in some of the cooler parts of the Phoenix area. We decided to head up in search of snow on New Years Day in the morning. We headed up to the mountains east of town and played in the snow. It has been getting down into the upper 20’s for much of this week and I am definitely not used to the chilly weather! I really would like to get warmer, but the cool weather is great for my brumating reptiles. 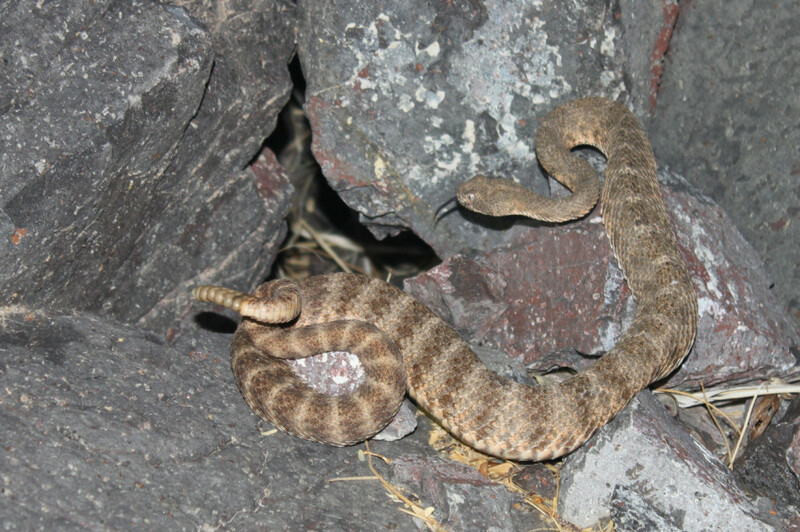 In thinking about getting warm I am reminded of this Blacktail Rattlesnake (Crotalus molossus) that I found a few years ago sunning itself in partial concealment under a rock. It was on St. Patrick’s Day to boot! Enjoy! Warmer weather is right around the corner and I hope to be able to do more herping this year! I haven’t found an Arizona Coral Snake since 1993. It’s been a long time. I have anticipated finding another one each and every time that I was looking for reptiles within their range during our summer rainy season. Finally, after a nice rain storm this past September, I finally found my second Coral Snake! Here is a short little video. Coral Snakes are venomous so if you find one, do not pick it up and likewise if you see a snake and cannot tell if it is a coral snake, then you should also not pick it up. Well, I haven’t drawn anything since I was in high school. It has been almost 20 years. I decided to give it a shot. It definitely isn’t my best work, but I think it will come back quickly. I am going to try some more and put some more time into it. 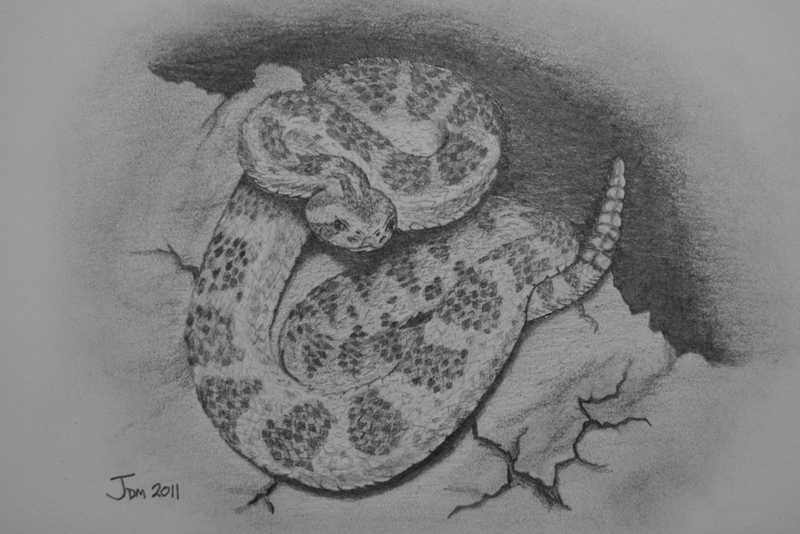 Here is a drawing of an Arizona Black Rattlesnake that I found a few years ago.